Camping Domaine des Pins **** is a family campsite located in the heart of the forest of Saint Hilaire de Riez on an area of 8 hectares. With its access to the beach through the forest (1. 2km), the campsite seduces by its natural and wooded setting. By car, shops are 4 kilometers away. Children and adults alike will appreciate the campsite's aquatic area with heated indoor pool and whirlpools and an outdoor pool with paddling pool and solarium. 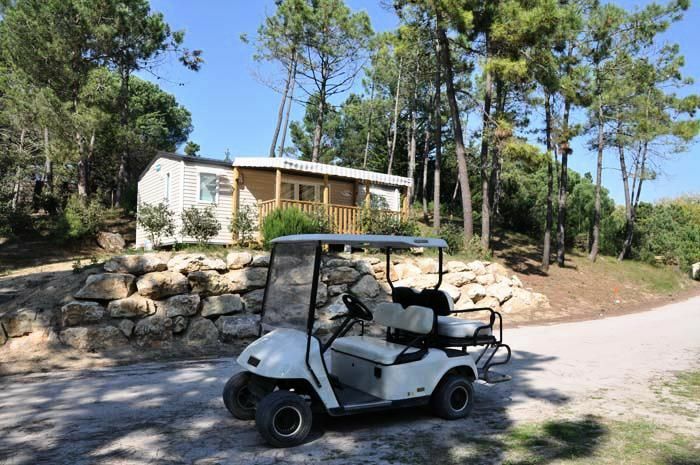 The campsite offers various activities: bicycle rental, table tennis and petanque area, games rooms and TVs, children's playground with slide and inflatable structure in the shape of a caterpillar. Entertainment is organized in July and August for adults and also for children who also have fun at the kids' club. Two bike paths from the campsite will allow you to explore the Vendée with 770 kilometers of slopes. In the region, discover Saint Jean de Monts, Saint Gilles Croix de Vie, Noirmoutier or the Ile d'Yeu, without forgetting the unmissable Parc du Puy du Fou. Mobil-Home of 30m ² for 4/6 persons, composed of a living room with a convertible sofa, a done up kitchen, a room with a double bed, another room with two simple beds, a room water with shower, separate toilet and an equipped kitchen. The Mobil-Home has two bedrooms with each blanket and pillows provided, a kitchen equipped and equipped with a refrigerator, hotplates, a microwave, a coffee maker, kitchen utensils and crockery for 6 people. A cleaning kit is also provided (broom, mop and bucket). Wooden terrace with garden furniture. Namely: the towels and bed linen are not included in the rental. Wifi access: free at the reception point. Playground for children: With slide and inflatable structure. Bed linen: 15 € / week / bed. Towels: 10 € / week / person. Parking: 1 place per accommodation. Breakfast: Breakfast service (for a fee). Hiking: bike path from the estate. Many walks on horseback, on foot, bike to do in the area. Restaurant: catering, bar and bakery services (July / August). TV: 35 € / week (TNT 11 channels).